Münchner Weißwurst ("Munich-style White Sausage") is a German specialty from Bavaria. It's made from veal, pork and pork skin and is often served with Krautsalat (German-style cole slaw), pretzels and a special sweet mustard ("Weißwurstsenf"). Bring 1l / 1 quart of water to a boil. Simmer pork skin and onion for ca. 15 minutes. Remove from water, run through meat grinder, set aside. Combine lean meat (pork, veal), spices, salt and half of the ice. Blend in the food processor until you have a smooth farce. Set aside, refrigerate. Blend in lean meat farce. Stuff 16 sausages using a sausage stuffer or a sausage stuffing attachment. Do not overstuff, when twisting the links, leave a little room for expansion in each link. If necessary, remove large air bubbles by piercing the casing with a skewer. Tie off the links. In a large stock pot heat up water to 80°C / 175°F. Check with thermometer. To serve, heat up with some fresh parsley in hot beef stock (or salted water). Do not boil. Serve with fresh pretzels and sweet mustard ("Weißwurstsenf"). Update: As Bart points out in his comment, Krautsalat is not a traditional side dish. You need a powerful food processor to prepare the stuffing in large batches. My 14-cup model with a direct drive works just fine. Be careful with smaller models with belt drives, they may not be powerful and sturdy enough and you may break the drive belt (I did that some 5 years ago)! If you have one of these, run the meat through a meat grinder first and process only very small batches. For best results, use a dedicated sausage stuffer. Meat grinder attachments have the tendency to warm up the stuffing which may cause the fat-water emulsion to separate. I buy my casings from Allied Kenco Sales, but there are many other sources for casings and stuffing equipment. I adapted this recipe for home use from a recipe in , a book with sausage recipes for professional butchers. I can't recommend this book for general home use, since it is very expensive and the recipes do not contain detailed lists of spices (they refer to premixed sausage spices instead). This brings back such sweet memories of my German Grandparents and my grandma's fantastic cooking. Thanks! Ich bin gerade auf Deine website gestossen und moechte Dir dafuer meine Hochachtung aussprechen. Sie gefaellt mir sehr gut. Nur auf eines moechte ich Dich hinweisen: In Bayern werden Weisswuerste nie und nimmer mit Krautsalat gegessen. Die einzig richtige Art ist, wie Du ja auch richtig bemerkst, mit suessem Senf (vorzugsweise Haendelmeier aus Regensburg), frischen Brezen und einem (oder mehreren) Hefeweissbier(en). Etwas anderes ist es hier in den USA, da werden sie sogar gegrillt. Aber das ist eine andere Geschichte. 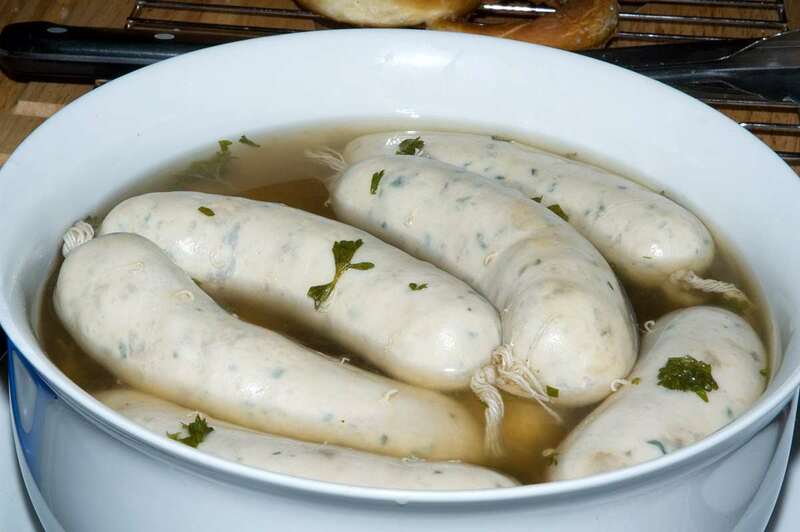 First, I wanted to say that this is a great recipe and makes an excellent Weisswurst. In the future I will only be using this recipe for my Weisswürste. Second, as I was unable to find veal for a reasonable price near me, I ended up substituting chicken 1:1 for veal using a mixture of breast meat, thighs, and drumsticks. Although technically no longer a Weisswurst as it is not 51% or greater veal, the sausage I made was nearly indistinguishable from what is found in Munich; the flavor was great and the texture was perfect. I think that next time I may replace the veal with mostly chicken and a small amount of beef, to more closely replicate the flavor of veal. I would definitely recommend chicken as a low cost replacement for veal. Thanks for the feedback! I will have to try that too, since veal is quite difficult to get here, too. 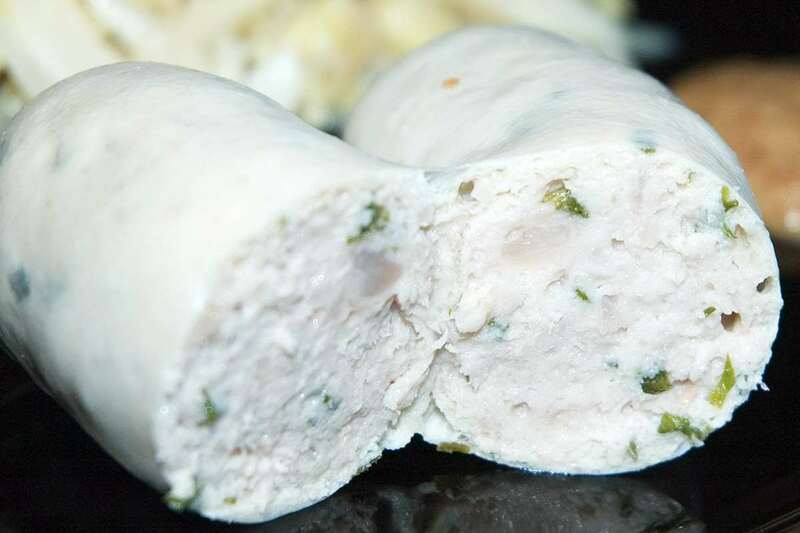 I'd like to know (if you know) where I can buy this sausage locally; I live in Buffalo, NY. My grandma used to make several German dishes; spaetzle, spirrknicht, & kransbrot, etc. Thank you. Every year, I host a party where I unload all my extra homebrews from the previous year, to get clean empty bottles for another year of brewing. It began with the name Gregtoberfest und Jertag (another of my brewing friends) and now is in it's 5th year running. I'll be making this weisswurst recipe this year for sure! I have only found this recipe today after a search of over 15 years. White pudding, as it is known in Australia, used to be available in most Butcher shops but is now hard to find. Will be making this tomorrow and will let you know what I think. Thanks again!